Bulk REO packages are less time consuming and a lot less headaches. It's an investment strategy that's best for Intermediate and Experienced investors. When the bank's REO agents fail to sell an REO property through the MLS (multiple listing service), it's packaged up with other REO properties, into a "tape" and discounted even more. Wholesaling or brokering the properties enables you to make money on the package while retaining a property or two for yourself. We call it double dipping. It's valuable to know how to structure a deal so that you are able to receive several paydays. The lowest priced packages will be sold in as is condition and for cash. Most properties will probably be vacant and need repairs, some will have code violations. Many properties may be vandalized or in hard war zone areas. But you can get them cheap, remember it's all about the bottom line. These types of properties are great for flipping back to rehabbers and landlords. It's just as easy to get good quality REO properties in bulk form. And some are cash flowing and with tenants in place. From these types of packages you'll want to take one or two properties for your long term rental portfolio. Be prepared, do your research, and connect the right people. Use a REO realtor. You want several of the top producing REO agents in the area sending you deals automatically. You'll find these deals to be clean and will close in a timely manner. It's important to do business with the decision maker and avoid "daisy chains" from unknown brokers who are not authorization to advertise or sell the tape. They'll just slow you down. Develop relationships with your local banks and credit unions because they're a great source for Bulk REO inventory. They'll let you cherry pick through the properties and make your own package. And don't be surprised that if after you have bought a few of their REO properties using OPM, that they start offering their money to you too. As with all business relationships act and look like a professional at all times. Credibility is key in the bulk REO industry. Have all the proper fixin's of a successful business in place and get funding secured before you begin. Flip the whole package. Most contracts that the banks, Realtors and mortgage companies use have non assignment clauses. Check out these 4 legal strategies to work around the restrictions. Break up the bulk REO package into smaller and single units. The pretty properties that are performing with cash flow and needing little or no repairs send out to your buyer's list of Landlords who like turn key properties. If the nice ones qualify for traditional financing, then sell them to a retail buyer because it will produce the highest profit margin with the least amount of work. The ugly properties, market to your buyer's list of rehabbers. If the complete package has the potential for a cap rate of 20% or better than flip the complete package to one of your heavy hitting investors on your buyer's list. Here's free software to create detailed rehab costs, budget and projected profits reports that can be given to your potential buyers. Online professional services and social media networking, such as Facebook and Linkedin will let you connect with other investors and build your cash buyers list. PRO TIP: Most REO packages contain a variety of different properties. So it's important to build your buyer's list with investors who use different investment strategies to build their portfolios. 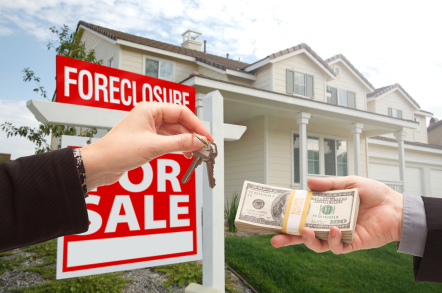 Foreclosures are still the most lucrative niche in real estate today. Push the banks to the limit. Now's the time to cash in on their loss with bulk REO packages. It's a deal that's sure to put a smile on your face.